Our top seller: a pure white puff. Fine plant fibers gently cleanse away dirt. Recommended for individuals with sensitive skin or atopy. The jet-black puff is created by adding bincho-charcoal to a konjac puff. The absorptive action of the charcoal powder draws dirt and excess sebum out of pores, keeping skin clean. The delicately scented green tea puff is made by adding powdered green tea to a konjac puff. Green tea has a sterilizing effect, and it also facilitates beautiful white skin by combating inflammation from acne and pimples and preventing spots. 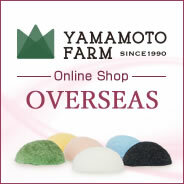 The cherry blossom-colored puff is a konjac puff with cherry leaf essence added. Leaves from the Yoshino cherry tree are used most frequently in cosmetics, and have been reported to repair roughness, combat inflammation, and whiten skin. This version sold only at New Year’s. The refreshing wild mint puff is made by adding wild mint to a konjac puff. Wild mint has anti-inflammatory and disinfectant properties, and is added to cosmetics to keep skin clean and improve texture. This version sold only in early summer. The yuzu puff is made by adding powdered yuzu, a citrus fruit, to a konjac puff. Yuzu fruit essence is used in cosmetics and soaps as a humectant, to keep skin moist and soft. This version sold only in autumn and winter. A bright red puff, created by adding domestically produced camellia oil to a konjac puff. Camellia seed essence has been reported to have anti-inflammatory and anti-allergy effects, and it helps protect skin from winter dryness. This version sold only in winter. Summer version, White peach puff! Peach leaf extract entered. Peach leaf extract is known as a component to prevent chilly heat rassh and prevent rough skin. White peach color uses pink clay and white clay, coloring is not used. Including brilliant pearl powder. We use Japanese pearl. The ingredient included in the pearl is a high-quality of moisturizing ingredient called collagen from the sea, which was regularly used by Cleopatra so the beauty effect of pearl has been passed down since ancient times. It is effective to promote the metabolism and also activate turnover of your skin. Our Number 1 long-time best-seller. This pure white face sponge can be used by everyone, from babies to mothers. Its weak alkalinity rinses away grime and dirt even without the use of soap. A jet-black face sponge made by adding bincho-charcoal to a face sponge. The absorptive action of the charcoal powder draws dirt and excess sebum out of pores, keeping skin clean. A cherry blossom-colored face sponge with cherry leaf essence added. Leaves from the Yoshino cherry tree are used most frequently in cosmetics, and have been reported to repair roughness, combat inflammation, and whiten skin. It is more information and catalog. Please visit our Contact Us corner. We will deliver directly from Japan dedicated factory. Konjac sponge puff overseas shop. Our sponge is made from genuine japanese stuff.